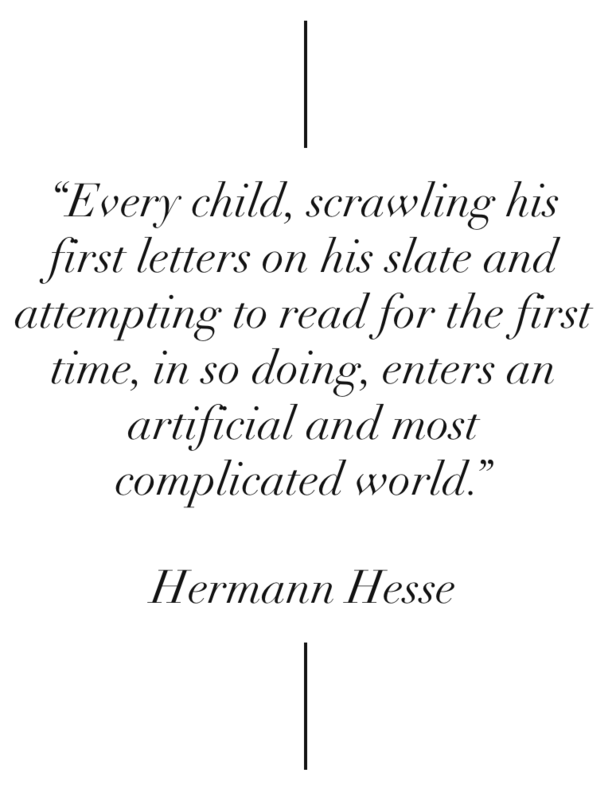 Once again I feel the desire to return to the inspiration for The Literacy Bug: the philosopher Ludwig Wittgenstein. By this stage, it lies in the distant past that this website was once known as Wittgenstein on Learning, but despite the passage of time Wittgenstein’s influence remains ever present. The man was preoccupied by how we are able to express anything whatsoever through language. And in his flawed masterpiece Tractatus Logico-Philosophicus, Wittgenstein presents us with a conceptualisation of language which encourages us to be amazed by our ability to transfer pictures of the world through our utterances. From this perspective, a function of language is to express propositions of the world to one another. That is, language is powerful because we can use it to propose states of affairs to one another through a system of sounds (to which we attach shared meaning). By propositions, we can take it to mean “sentences on the world”. Through the lens of the Tractatus, each proposition (or sentence) paints a picture of a state of affairs, and that state of affairs is open to consideration and contemplation (as long as the speaker and the listener share some form of language). In other words, language permits people to generate, communicate and examine possible states of affairs, whether real or fictitious ... declarative or speculative ... true or false. I can convey and receive pictures through language, and there is no necessity that I am able to experience these pictures directly for me to understand them and draw meaning from them. If we take a moment to consider descriptive sentences, there is an elegant and meditative quality to the acts of writing and reading. In the acts of writing and reading, we are builders. We are builders of experiences. We are speculators on cause and effect. We are builders of how our concepts are meant to fit together. In writing, we may chisel out an unfolding picture as we lay sentence after sentence onto the page with the aim of describing how something occurred or how something works. We must have the patience, motivation and care to find this recording process beneficial and - in fact - important to how we live our lives. That is, we must find some value in recording an observation for ourselves and others to return to. In reading, we must find some benefit in encountering and constructing a mental image of a state of affairs as we come to navigate texts. Some texts may be more accessible, whilst other texts may be “harder to crack” because they are more difficult for a particular reader to generate pictures from them. Implied in all of this is a substratum to language: our ability to experience, perceive, notice, visualise, critique and represent aspects of the world or possible words. And whilst we have all read mechanically (focusing merely on decoding) at least once in our lives, we have also had to reread a section of text to get a proper image of what we failed to grasp in the first place. And if I am to demonstrate my comprehension, I’d be compelled to represent my understanding in some way (either in words, images or schematics). And we share these representations with others to determine whether our understanding of a text is shared by others. Have we extracted the right image? So … please imagine, explore and enjoy! The path to discovery involves many patient moments of illumination. Wittgenstein, L. (2001a). Philosophical Investigations (3rd ed.). Oxford, UK: Blackwell Publishing. Wittgenstein, L. (2001b). Tractatus logico-philosophicus. London: Routledge. Following in the tradition of Ludwig Wittgenstein, I am compelled to grasp a clear view (or perspicuous representation) of literacy. It is a view that is not encumbered by the various forms and instances of literacy. In the spirit of Hans Sluga (2011), the search represents a compulsion to articulate a surveyable representation of an unsurveyable whole. The unsurveyable whole - in this case - is the history of the written word and its current manifestations in print and digital form. While this might seem an esoteric preamble to an otherwise basic blog entry, I was not comfortable proceeding without a nod to the context to these words. Here are the elements of a clear view of literacy in English. 1. There are 26 letters in the English alphabet. 2. We use these letters and letter combinations to represent 44 phonemes or English sounds (give or take one or two). The clever reader will notice a curious fact about consonant and vowel sounds; there is a greater letter-sound correlation in relation to consonant sounds than there is for vowel sounds. It isn’t as easy to explicitly state the various letter and letter combinations which represent the 44 phonemes in English. 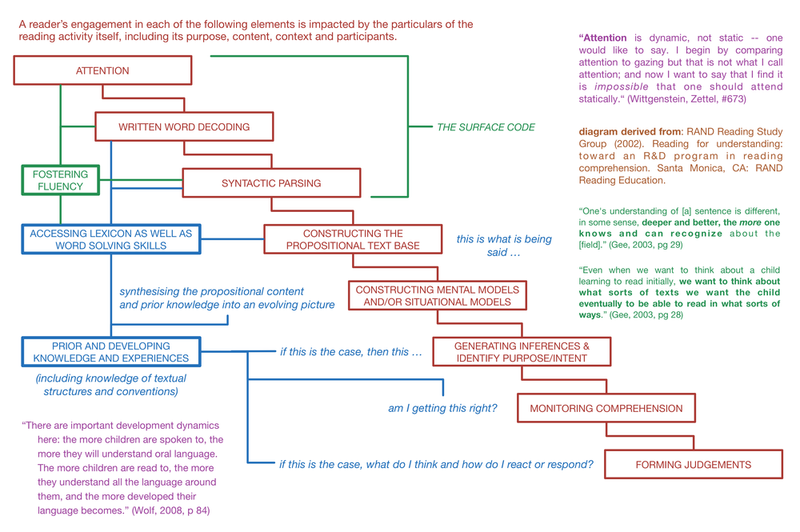 These are learned over time, and are analysed from the learner’s growing (print) vocabulary. For more information, please refer to to the charts below. 3. 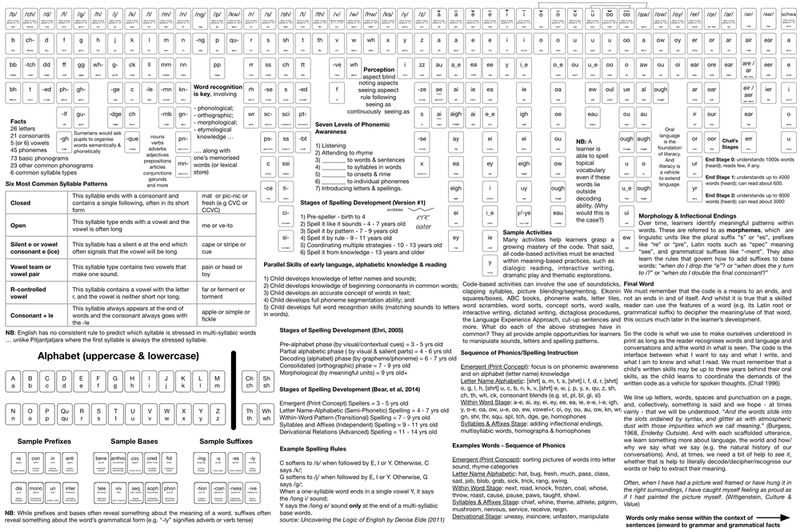 There are also 131 possible graphemes which represent those 44 or so phonemes. There are 74 possible consonant graphemes to represent the 25 consonant sounds, and 57 vowel graphemes to represent the 19 vowel sounds. A grapheme can be an individual letter (like the letter "k") or it can be a group of letters (like the grouping "igh", "ph" or "ea"). And a grapheme can make more than one sounds. For example, the letter "a" can make four different sounds, as in cat, baby, father, alone. The letter "a" makes two sounds in the common word "banana". Can you identify the sounds? The following diagram shows a mapping of the 44 phonemes and all the grapheme which can represent those sounds. Learners do not recognise all graphemes from the get go. In terms of learning, the following is a recommended order in which children explore the various graphemes in the first three to four years of school. 4. These sounds/graphemes are joined to form syllables. There are six common syllable types in English. In an analytic phonics approach, learners analyse known words to gain a firm grasp of letter-sound correspondences and word patterns. In a synthetic phonics approach, learners progressively move through letter-sound patterns of increasing complexity. Both approaches should be systematic, developmental and integrated. In practice, both approaches should be used, though one approach may be more or less dominant or effective. Eventually, knowledge is built up over countless encounters with words. Some words we just remember. Other words we decode, encode and recognise in context. 5. Word level fluency is not enough to engender reading/writing fluency, though. Learners must also become adept at rapidly interpreting, scanning and generating the grammatical elements in our sentences. We must identifying the components of syntax, and understanding how the logic of this syntax allows one to express states of affairs and to understand states of affairs expressed in utterances. This includes the ability to track pronouns - for instance. The structure of a sentence explains how elements are related to one another (e.g. The cow jumped over the moon). This includes an awareness of the various types of words (e.g. nouns, verbs, adjectives, etc). We need to know the words to extract sense from the sentence. And we often need to grasp the intention/conversation of the sentence to grasp its meaning. To consolidate: Structural features are mastered whilst an individual is in the early stages of learning language and literacy. Whilst the learner is learning, teachers are directing the learner’s attention to the way in which language is represented in print. It is here that we need to proceed with caution. The above (meta-linguistic) knowledge is necessary but not sufficient for full literacy development. It represents the form of our utterances but not their content. Actual utterances have content (i.e. refer to things and are parts of conversations). Actual statements are also more complex than the formulaic syntax learned in formal grammatical study. Actual utterances include nuances of idiomatic language, fragmented constructions, rhetorical devices and more. We get close to a mimetic portrait in Ernest Hemingway’s “Big Two-Hearted River”, but even “Big Two-Hearted River” requires its audience to be familiar with the general context, the language/vocabulary, and the overtones of Romanticism. Ludwig Wittgenstein was a philosopher obsessed with the difficulties of language, who wanted to help us find a way out of some of the muddles we get into with words. Schneider (2014) also notes this implicit and confounding dilemma. Any formulaic, analytic theory of meaning makes only so much progress through a focus on structure alone. Eventually, one must include the imagination/experience/context/shared language of the speaker and the audience as part of the equation. Formal theories of meaning seek to explain how propositions express a sense, hopefully clearly and unambiguously, through an understanding of the proposition’s logical structure. In such a case, one must have access to the phonetic, orthographic, syntactic and lexical knowledge to be able to decode the sentence and to decipher the picture expressed within the sentence. This process is quite a static exchange. Wittgenstein himself was inspired by Gottlob Frege to contribute to the formalist, analytical project in the Tractates Logico-Philosophicus, but would soon find this pursuit inadequate to explain how meaning is expressed beyond a very limited frame. Wittgenstein found that meaning - in context - is less static and more elusive. The meaning of an utterance requires an understanding of the utterance’s context, a familiarity with the way the utterance is being exchanged, the intentions of the participants, and the position of the utterance within a “language game” or “conversation”. For instance, the meaning of the phrase “he is a Red” could meaning “He is a communist”, “He is a supporter of the Liverpool Football Club”, “He is a Native American”, or some other derivative. Its meaning is dependent on factors outside of the logical structure of the utterance itself. For another example, let's say someone said, "I really loved Madagascar." The individual could be referring to the place, the film or Madagascar vanilla (as opposed to another type of vanilla). There might be an audience who wouldn't find the phrase ambiguous (they only know one meaning for Madagascar) or it might not be meaningful at all (they have no concept of Madagascar whatsoever), even though they understand the grammar of the sentence and can accurately pronounce each element. Therefore, actual elements of context, content, purpose, practice, deliberation and cognitive/information processing must be dealt with to leap into meaning. This does not negate the importance of direct, explicit instruction in the structural elements of language and literacy; however, we must acknowledge that formal skills only facilitate communication. They are not the germ of communication. A. TLP 3.13: A proposition includes all that the projection includes, but not what is projected. Therefore, though what is projected is not itself included, its possibility is. A proposition, therefore, does not actually contain its sense, but does contain the possibility of expressing it. (‘The content of a proposition’ means the content of a proposition that has sense.) A proposition contains the form, but not the content, of its sense. C. PI 496: Grammar does not tell us how language must be constructed in order to fulfil its purpose, in order to have such-and-such an effect on human beings. It only describes and in no way explains the use of signs. D. Z 91: Ask: What result am I aiming at when I tell someone: “Read attentively”? That, e.g. this and that should strike him, and he be able to give an account of it. — Again, it could, I think, be said that if you read a sentence with attention, you will often be able to give an account of what has gone on in your mind, (e.g. the occurrence of images). But that does not mean that these things are what we call “attention”. E. TLP 3.141: A proposition is not a blend of words. — (Just as a theme of music is not a blend of notes.) A proposition is articulate. F. CV: Often, when I have had a picture well framed or have hung it in the right surroundings, I have caught myself feeling as proud as if I had painted the picture myself. That is not quite right: not “as proud as if I painted it, but as proud as if I had helped to paint it, as if I had, so to speak, painted a little bit of it. It is as though an exceptionally gifted arranger of grasses should eventually come to think that he had produced at least a tiny blade of grass himself. H. PI 533: How can one explain the expression, transmit one’s comprehension? Ask yourself: How does one lead anyone to comprehension of a poem or of a theme? The answer to this tells us how meaning is explained here. Let’s simplify language to the declarative statement that has the capacity to convey the unambiguously. Ahmad, M. M. (2014). The Tribe. Western Sydney (NSW): Giramondo. Hemingway, E. (1995). The Collected Stories (Everyman's Library Classics). New York: Everyman's Library. Williams, W. C. “The Red Wheelbarrow” n.d. Web at https://www.poets.org/poetsorg/poem/red-wheelbarrow. Wittgenstein, L. (1967). Zettel (Z). (G. E. M. Anscombe & G. H. von Wright, Eds.). Berkeley, CA: University of California Press. Wittgenstein, L. (1974). Philosophical Grammar (PG). (R. Rhees, Ed.). Berkeley, CA: University of California Press. Wittgenstein, L. (1980). Culture and value (C&V). Chicago: University of Chicago Press. Wittgenstein, L. (2001a). Philosophical Investigations (PI) (3rd ed.). Oxford, UK: Blackwell Publishing. Wittgenstein, L. (2001b). Tractatus logico-philosophicus (TLP). London: Routledge. Phillips, D. (1977). Wittgenstein and scientific knowledge. London: Macmillan Publishers Limited. Schneider, H. J. (2014). Wittgenstein’s later theory of meaning: imagination and calculation. Oxford, UK: John Wiley & Sons. Sluga, H. (2011). Wittgenstein. Oxford, UK: Wiley-Blackwell. "Is Wittgenstein’s famous aphorism, 'Whereof one cannot speak, thereof one must be silent' a profound truth? Or is it a banal truism, along the lines of 'That which you cannot move, you must leave where it is'? It may sound platitudinous, but if you think about what exactly lies beyond the limits of language, matters soon become much more opaque. "Consider all those occasions when words are simply not enough, such as when we try to express some of our deepest emotions. Phrases such as “I’m sorry for your loss”, “I love you” and “that’s awful” can all be true yet sound pathetically inadequate compared to the intensity of our feelings or the enormity of what has happened. Perhaps that is why the tradition of a minute’s silence for the dead is so powerful: it is not so much a mark of respect as an acknowledgment that nothing we can say or do is up to the task of capturing what has been lost."